1969 The 1969 Mustang Boss was first introduced in 1969 by the newly hired GM designer Larry Shinoda. The Boss came in two forms for the fastback body line: the Boss 302 used a 4 barrel version of the 302 cubic inch, V8 to increase the horsepower by 80 to 290hp; and the Boss 429 had the largest Mustang engine of 1969, a 429 cubic inch, 4 barrel, ram air, V8 with 375 horsepower. The Boss came with special "Hotchkiss" type rear suspension and many other performance options and body options to handle the larger power and seven inch Magnum 500 rims. The first 50 Boss Mustangs were hand built. 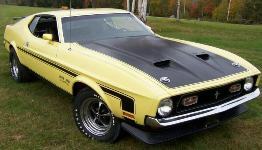 1970 The 1970 Mustang Boss came in two models: the Boss 302 and the Boss 429. The Boss came only in the fastback body style and included either the 302ci or 429ci V8 engine, Drag Pack suspension, Convenience Group, clock, power steering, power front disk brakes, tachometer, AM radio, functional front air spoiler, decor group, competition suspension, trunk mounted battery, and bucket seats with center console. 1971 The 1971 Mustang Boss 351 came only in the fastback body style and included either the 330hp, Ram Air, 351ci Cleveland, V8 engine; and with many of the 1971 Mach 1 options including competition suspension, functional black spoiler, blacked out NASA-styled hood, honeycombed grille, color keyed racing mirrors, hub caps or trim rings, black or argent silver stripes, and fender moldings. 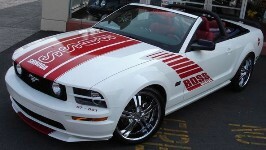 1996 The 1996 Boss Shinoda was built by Shinoda Performance Vehicles (SPV). They were placed on the GT and Cobras and came in two levels. Level 1 (Gen I) was a graphics package, Budnick wheels, and a body package (front spoiler, wheel flares and rear "super" spoiler.) The Level 2 (Gen II) added some performance upgrades such as the Shinoda wheels and suspension modifications. As with other companies making modifications to cars right from the Ford factory, all the SPV items could be ordered and placed on any Mustang. SPV Factory modifications included a dash plaque and Shinoda serial number. These were generally built 1994-98, but I have seen SPV dash plaques on later cars as well. 2007 Team Shinoda builds a whole set of Boss Shinodas for 2007 in both coupes and convertibles. They have the 429, Legacy, Level 1, Level 2-S, Level 2-T, Level 2-FR, and the Level 3. The packages contain different body kits, interior trim, wheels, and badging. 2008 Team Shinoda builds a whole set of Boss Shinodas for 2008. They have the 429, Legacy, Level 1, Level 2 (S, T, and FR), and Level 3. The packages contain different body kits, interior trim, wheels, and badging as well as engine and handling performance upgrades. 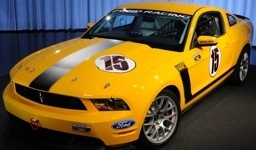 2011 The 2011 Boss 302R Mustang is a non-street legal or track only car, limited to 50 units, a Ford racing option available for $79K, roll cage, safety harness, data acquisition system, race suspension, special tires, and side stripes. We don't think the color shown here is the new 2011 Yellow Blaze. 2012 There are several versions of the 2012 Mustang Boss: Mustang Boss 302 limited edition has a 440hp, 5.0L, V8; custom wheels; custom handling, and custom graphics. The extra power comes 302R technology: forged rotating assembly, CNC ported heads, and upgraded camshafts and intake. 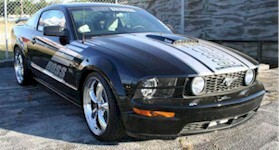 The Mustang Boss Laguna Seca 302 also has the 440hp, 5.0L V8; but it has a close-ratio six-speed transmission, a standard Torsen limited-slip rear differential, upgraded suspension tuning, 302R front splitter, black or ingot silver with red accents, blacked out grille with blocked out fog lamps, and a cross-bar X-brace instead of back seats. 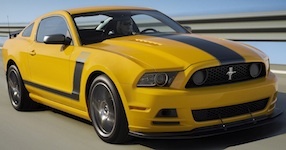 The Mustang Boss 302S is similar to the Boss Laguna Seca except that it has a black louvered hood insert, black (Laguna Seca has red) painted 19 inch wheels, large carbon fiber Ford Racing rear spoiler, 6-point roll cage, Pro-Racer seat, quick release steering wheel, a Recaro HANS system, and AiM data acquisition system. And to top that off, how about the Mustang Boss 302R built specifially for racing only. 2013 The 2013 Mustang Boss 302 includes the new vented hood of the Mustang GT and grille design but continues with the tradition of blocked out fog lamps on a blacked out grille with tri-bar pony emblem. The blacked out rear spoiler, rear decklid panel and stripes remain as well as the Laguna Seca package which adds many more Ford Racing options.